The area around your home or business may be beautiful, and the views might be expansive and great. But…is it too wide open? On the other hand, the area around your home or business might be very busy with little or no privacy. Is your property too vulnerable? In either scenario, you may want to look into fence installation for your property. 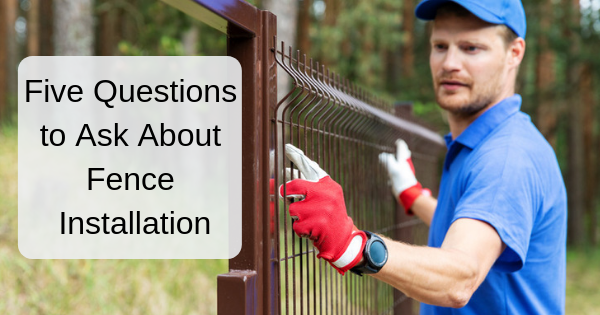 Here are five things to ask a residential or commercial fence contractor before you start your project. One of the first things to consider when you get involved with a fence installation company is the materials that their fences are made of. Do they offer a choice of eco-friendly materials, such as bamboo? Wood, chain-link, aluminum, and PVC vinyl are also other materials that can be used. If you prefer a more natural barrier, there are fence installation companies that use natural fencing with blackberry bushes and other types of shrubbery. Make sure that the fencing installers will be using a measuring tape or a rolling-type wheel measuring device to get accurate measurements. They should come to your property and give you an estimate, usually for free. Be sure to clarify if it is free or not. Also, ask that when they install a fence, will the installers will be checking all the angles? And be sure to confirm what tools they will use to do this. For example, some installers will use a laser level to install posts. Lines should be crisp and sharp, not tilted or uneven. Installing a fence in a home or on a business property is not a project you want to tackle again in a year or two. In fact, a big factor when deciding on which fence installation company to use is the warranty they offer. Be sure to ask for confirmation that the posts are included in the warranty. And if you have entrance gates such as with a pool enclosure, or an English lattice fence, be sure to ask about what parts of the gates are covered by the warranty. This will save you headaches further down the road, in case any replacements need to be done. Will you be able to do the upkeep on your fence yourself, or will you need to call the professionals? What do the experts recommend? How long will the materials look great before they need to be touched up? For instance, if you install a wooden fence, it is advised that it be stained or painted every two or three years. As a property owner, it is important to consider having an attractive, but not high-maintenance, fence to keep the overall cost of the project down. If you’ve never had to get involved in fence installation, this point might not be the first thing that comes to mind. But it matters. The life expectancy of your fence will depend on the materials used and the weather where your new fence is installed. Time and weather bring a lot of wear and tear on materials. Ask the estimator their opinion about the choice of materials they would recommend for your particular property. They may have an idea for a fencing material that could save you money. Let’s face it, fence installation is a big project. And making any kind of property improvements or remodeling can be expensive. Yet, there are many benefits. A good fence will add to the value of your property. And as the saying goes, good fences make good neighbors. Sounds like fence installation, then, is a win-win project.